Between Halloween candy overindulgence and Thanksgiving pie decadence is a peaceful season where simple autumn desserts give our bodies a break as well as a lift. While raw persimmons, pears, and pomegranates conveniently fill the everyday dessert bill, baked or poached apples provide more elegant treats for special occasions. And with very little fuss—10 minutes of prep and less than an hour of cooking time. Plus, an aromatic apple and spice smell issues forth from the kitchen, imbuing the entire household with an iconic fragrance of autumn. The original recipe calls for chilling the apples and syrup before serving. This works well as a dessert. 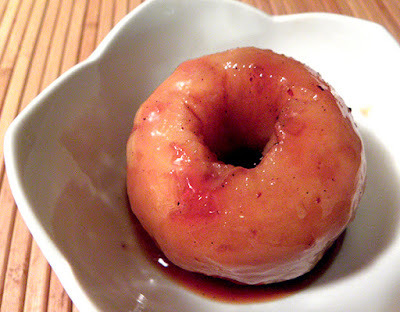 However, as a late night snack, my husband and I preferred the leftover apples and syrup heated. 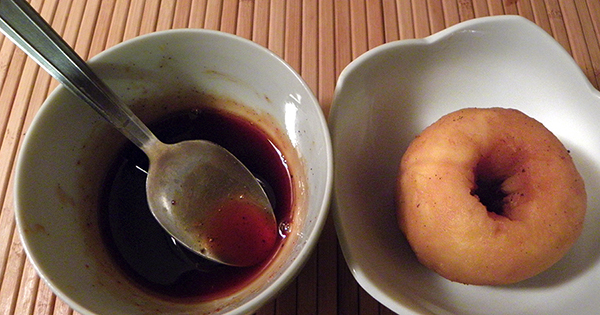 To reheat, separate the syrup from the apples. Microwave the refrigerated apples for about 20 seconds (or to your liking) and the syrup for about 30 seconds. Then spoon the syrup over each apple in its individual dish. It's that late autumn waning daylight time of year. Take the time to enjoy food with family and close friends during the last of these golden and russet days as the season rolls on towards winter. Take Care that Heated Apple isn't too Hot! Add apple juice to spices in saucepan. Peel and core apples. Add to apple juice and spices. Liquid must cover the apples. Add more juice or water if needed. 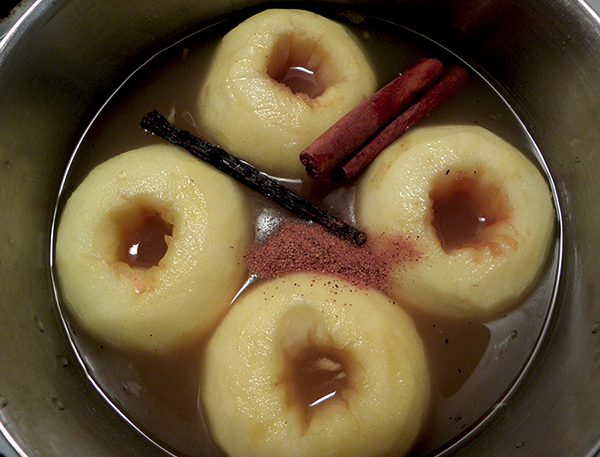 Bring to simmer over medium heat, and simmer gently until apples are just soft, about 10 minutes. If apples float to top rather than staying immersed in the juice, weight them down with a small lid or a vegetable steamer (sounds weird but it works), or flip the apples over every few minutes. Remove apples from liquid and place them in a large bowl. Set aside to cool. Remove cinnamon sticks and vanilla bean. Reduce poaching liquid to a light syrup by simmering uncovered over medium high heat for 30 – 40 minutes. 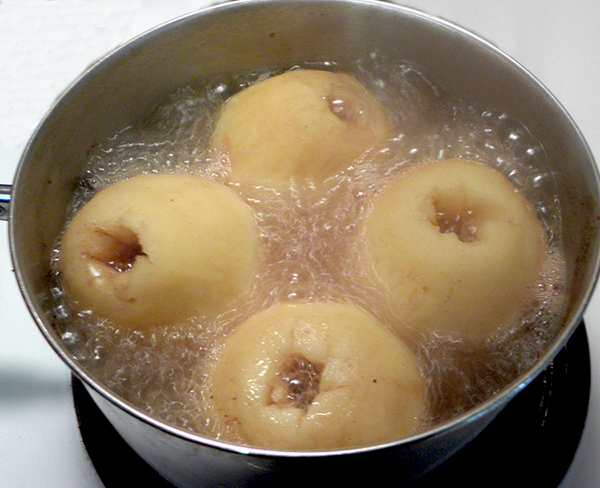 Don’t overcook to a heavy syrup, as it won’t flow over the apples easily. To serve: Place an apple in each dessert bowl. 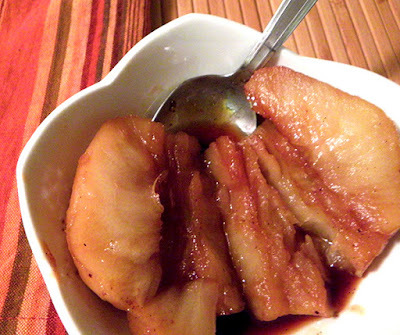 Spoon syrup over apples. Garnish with fresh mint leaves. 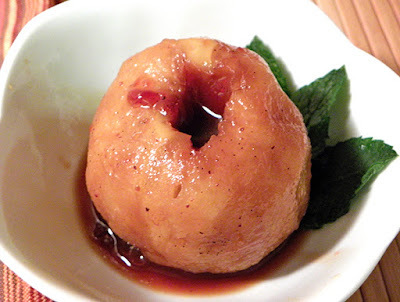 To serve apples reheated: Separate the syrup from the refrigerated apples. Microwave the apples for about 20 seconds. Microwave syrup for about 30 seconds. Then spoon the syrup over each apple in its individual dish. You may want to skip the mint garnish, as the hot fruit may absorb too much minty flavor.